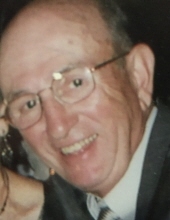 DANIELSON - William (Bill) T. Lawson, 88, of Danielson, CT passed away peacefully with his beloved wife, Bertha (LeBlanc) Lawson and family by his side. Born April 8, 1930, he was the son of the late Hugh and Ada Lawson and grew up in West Hartford, CT. He was also predeceased by his sister, Joyce Lawson-Pomeroy. Bill was a stand-out athlete and graduated from Hall High School in West Hartford, playing football, basketball and baseball. He later played baseball while attending Nichols College in MA. After serving time in the Air Force, Bill went on to finish his college degree at the University of Maryland – with a degree in engineering. He met his wife Bertha and moved to the Danielson area 60 years ago. The majority of his career he worked in Human Resources at both American Standard and Kaman and also served on numerous professional boards and organizations. He retired in 1992 and he and Bertha enjoyed their time together, spending winter months in Florida, golfing and watching their grandchildren’s sporting events. One of the places he found the most pleasure was at their cottage on Alexander’s Lake, swimming, boating and socializing with family and friends for over 40 years. Besides his wife Bertha, Bill is survived and will be deeply missed by his four children and their families. Karen Dootson (Ken) of Marlborough, CT; Lynne Norris (Jeff) of Meriden, CT; Sandra Ebdon (Drew) of Ledyard, CT and Russell Lawson of Merrimack, NH. He loved his grandchildren and took great pleasure in watching them play sports and grow up – Brett and Kendra Dootson and Ty and Max Ebdon. He also leaves several nieces and nephews. Services will held at the discretion of the family at a later date. To send flowers or a remembrance gift to the family of William T. Lawson, please visit our Tribute Store. "Email Address" would like to share the life celebration of William T. Lawson. Click on the "link" to go to share a favorite memory or leave a condolence message for the family.